In the picture below I was helping Bill in his office. 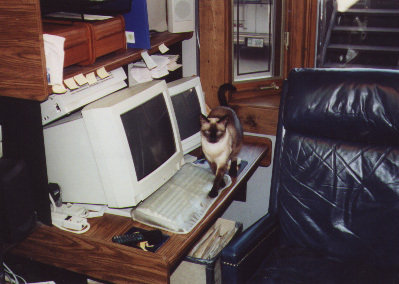 I used to balance up on top of his chair and he would try s to sit down real slowly so that I wouldn't fall off. Welcome to my page. I'm not half the cat that Lit'l Petey is but I never thought that I would be on the Internet with my own web page! 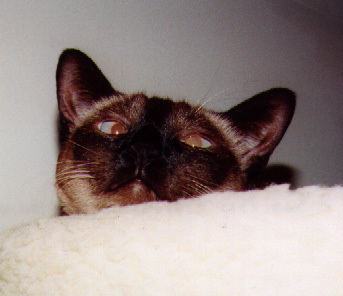 I was a cross eyed and I snored at night and I certainly didn't have the selective genes that other kitty's have. 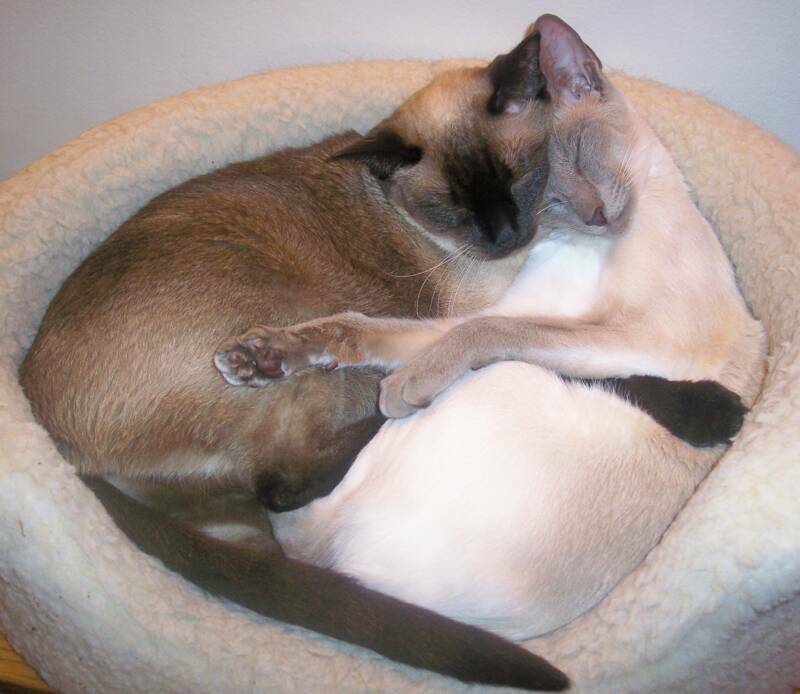 In fact I'm was a little nuts, but aren't all of us Siamese a little goofy? Sometimes I would run all through the house and bat around a ball with great passion but there was no ball, it was all make believe. Nobody seemed to understand me but Bill. He used to throw the make believe ball and then I would go nuts and have something to do for a few hours. Call me crazy but we know how to communicate. I was very vocal and made a comment about everything and was not afraid to express my opinion just like Mr. Magoo. I was a stray that showed up on Bills back porch and I was very pregnant but Bill took care of me by getting me some first class surgery at the Anti-Cruelty place downtown. I was a four paw declaw so I really couldn't defend myself in the streets and my former owner spent all that money declawing me but didn't''T get me spade, so when I went into heat I left home because my urges were out of control. Bill ran an ad trying to find my owner but nobody called so he adopted me. Click on this to see how cross-eyed I really am. Here I am helping Bill in the office by embelishing all the information in the computer with my feet. He likes when I do that.